Where have you hidden the electrical cords? Checked it out. NOT there! This chair or fabric came from somewhere. Anybody out there know where??????? Chair is not in Thomasville either. Fabric is not at guru. Lots of ikat, but, NONE as pretty as this. What is the fabric on the chairs? Love it! Please help me find that fabric!!! Who is the manufacturer of the wing chairs? I can't find thechairor fabric in Thomasville. Where does someone get that desk? Art - Where can I purchase the two large art pieces? Thomasville Furniture. They are titled "Harmony". What is material on chairs? - What is the material on these chairs? Or who is the manufacturer? Where can I find a lamp like this? love the ambiance of room, can you share paint color & brand? What kind of wood is that? The stain color? Love it that it is such an easy neutral! Comfort: What does each person require to be comfortable? Sharing an office doesn't mean that you need to have identical work areas. Each person's desires should be taken into consideration. Not too long ago, I helped clients who had very different needs for comfort but really wanted to share their home office. One felt most comfortable sitting at a desk to do her work and she wanted strong task lighting. Her partner hated sitting at a desk and instead wanted a big comfortable chair to curl up in with her laptop or books — and she wanted soft lighting. This office might have been designed for a similar couple. There is a desk and chair with a good desk lamp for one person, while there is also a comfortable chair with a side table lit softly from a wall sconce for the other person. 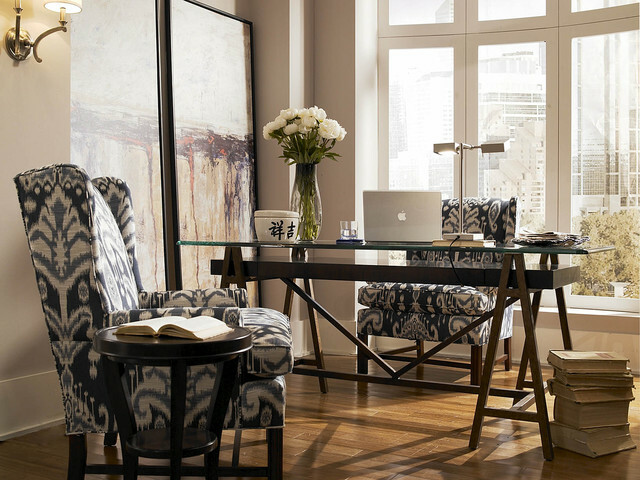 A pair of wing chairs by Thomasville Furniture gets a bold update when covered in a large-scale ikat fabric. Traditional design thinking would have us believe that upholstering chairs in big, bold patterns is a risky move and that sticking to smaller patterns is safer. But a bold pattern, especially in a room like this where there's little visual competition, is vibrant and adds lots of personality. A pair of ikat wingbacks and a contemporary take on the trestle table make this office feel more like a cozy breakfast nook.